2010 October « THE BRYCE IS RIGHT! I have always wondered about people who want to run for office. Even as a student in High School I never understood why someone wanted to be student body President since it was a frivolous position carrying little weight. If anything, it was indicative of a person’s popularity and perhaps looked good on a college application. Other than that, it meant zilch. Over the years I have seen this same phenomenon played out in numerous volunteer organizations where people thrived on the adulation of the title of their office but accomplished nothing. They accepted the title more as a status symbol rather than to achieve anything. I also found these same people ruled with an iron fist whereby nothing happened without their personal stamp of approval regardless of the triviality of the task. This becomes more insidious when applied to government, be it at the municipal, county, state, or national levels. I believe most officials accept the position for ulterior motives as opposed to accomplishing anything of merit. I have a theory regarding this; I believe most politicians are looking to become a part of what I call the “American Monarchy.” True, the United States is a republic using democratic principles, but make no mistake, there is a ruling class. The American Monarchy consists of career politicians who are more interested in personal glory and control than accomplishing anything of substance for their constituents. It is all about ego. Being a part of the monarchy entitles you to certain perks and privileges, such as automatic pay raises, and rewards from lobbyists, such as “fact finding” trips to lavish locations. Of course, not all politicians are of this ilk and I realize I am writing in broad strokes here, but the fact remains the perception of voters is that politicians are only interested in serving themselves, not the people who elected them. This also explains why incumbents are incredibly nervous as next week’s election approaches as an uprising is in the offing. Leading the revolt is the Tea Party which neither political party seems to understand. Sorry NBC, the Tea Party is NOT a political party, nor was it intended to be such, but rather it is a movement consisting of citizens as outraged with the American Monarchy as their Boston predecessors were in 1773 with the British Monarchy. The Tea Party is not subservient or beholding to anyone, least of all the Republican or Democratic parties. The message of the Tea Party is simple, “We have had enough,” and they are on a mission to depose the American Monarchy. What I find amusing in all of this is that the media and political power brokers greatly underestimated the will of the people. Whereas they were used to having their way for so long, they flaunted it to the point whereby life became intolerable for others and an uprising occurred. To my way of thinking, what we are witnessing is every bit as historical as the Boston Tea Party from which the movement derives its name. Both “parties” revolted against representation. The first time was by a foreign power, this time it is an internal struggle. Should the American Monarchy survive the mid-term elections, we only have ourselves to blame. Tune into Tim’s THE BRYCE IS RIGHT! podcast Mondays-Fridays, 11:30am (Eastern). I wore shorts to work the other day. Yea, I know, I’m the guy that says we should spruce up our image at work, but I did this to revolt against the rut I’ve gotten into in the morning (plus it was a Friday and I knew I wouldn’t be running into anybody). Like a lot of guys, when I get up, I have a light breakfast, scan the newspaper, shave, shower, get dressed for the day, and drive to work. It is all very boring and repetitive and frankly, I think I finally blew a fuse. 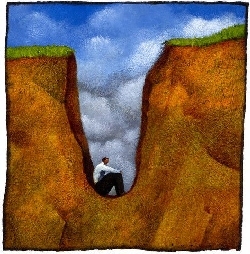 It’s easy to get into a rut regardless if you are a man or a woman. Whether you call it a rut or “writer’s block,” the danger is that you become stale and complacent and don’t think clearly. This is when productivity in the office is threatened by laziness and lack of concentration. I think this is why the vacation was invented, so that a change of scenery will perhaps reinvigorate us. It pays to try and ride a different horse now and then. Office managers should also be wary of workers falling into a rut. We may not be able to send them on an all expense-paid trip to Aruba, but we can do other things, such as reorganizing the furniture, adding a touch of paint here and there, adjusting the lighting and sound, introducing some new office equipment, etc. In other words, something for the workers to take note of and react to. In order to get your workers out of a rut, you have to do something that stimulates their five senses and intellect, perhaps a new type of assignment or job. If left unchecked, the tedium of a monotonous working environment will eventually drive away your employees, even the best of them. I had an occasion to visit a Sony factory in Japan years ago. While there I observed an assembly line where the various workers built television sets. Each workstation had its own set of responsibilities for adding components and checking the work that preceded them on the line. However, on the hour, a whistle would blow, whereby the workers would back away from the workstations and perform some simple calisthenics to relieve the monotony. If that wasn’t enough, each worker then rotated to the next workstation in the line where the work resumed. This made each worker cognizant of all of the steps needed to assemble the television set, as well as to promote the development of a quality product. I found this routine to be a simple yet effective approach for combating tedium. You also find managers who promote end of week parties in the workplace or perhaps hold special training sessions to develop skills. But I tend to believe the best solutions are the simple ones, such as the Sony example. I don’t normally recommend wearing shorts to work as a way to combat repetition, particularly if customers are going to be around. Instead, just pay a little more attention to the five senses of your workers. It can work miracles. I don’t think anyone likes what is commonly called “run-arounds” – you know, people who set up a bureaucratic process just to keep you busy and out of their way. There are other names for it, such as “chasing your tail,” “the dance of the fairies,” “bunco,” etc. No doubt you are familiar with the expression, “They are giving him the run-around.” Run-arounds ultimately represent a test of our patience, endurance, and determination to see something through to fruition. Government bureaucrats are particularly well known for creating run-arounds, be it at the federal, state, or local levels. Municipal health and fire inspectors can be particularly annoying in this regard. They are adept at creating a shell game whereby they identify several things you are doing wrong, you correct them, and when they return they suddenly discover a whole new list of things for correction. You learn quickly the list is never fulfilled as the inspector needs to show his/her supervisor they are doing something. Federal and state income tax bureaus can also drive you crazy with the minutia they require for their reports, thereby causing delays in processing. Corporate bureaucracies can be every bit as aggravating as government, particularly Human Resource (HR) departments who have mastered the art of procrastination. Maybe its because management allows certain fiefdoms to be built internally and jealously guarded by pit bulls. Such people tend to be “Theory C” types who are introverted detailists. They may have trouble communicating to other people, but are a whirlwind when it comes to adhering to rules and regulations. They tend to be very cautious and reserved, and will not venture into something until after all the facts have been checked out. When you apply for a loan, be it for either a home mortgage, automobile or commercial, you are typically strip searched for your financial and personal history. If you do not give them every last little detail, the loan application is conveniently lost thereby causing you to wait even longer. This makes me wonder how we ever got into the trouble with mortgage lending a few years ago. Maybe the only people who are so thoroughly interrogated are white Christians, and maybe everyone else got a free pass, but I digress. The fact finding run-around by the lending institutions is so rigorous and thorough, even the CIA envies the process. I have this image of lenders staying up late at night laughing at our applications, making notes about our financial situations, and figuring new ways to wear us out. It’s all rather humbling and exhaustive. I guess it’s a matter of how bad you really want something. Just wait until Obamacare kicks in – Kowabunga! You like run-arounds? Just you wait; you haven’t seen anything yet. Ever wonder why our computers typically last no more than three years? Many contend it is because of the fast pace of technological advancements. Maybe. 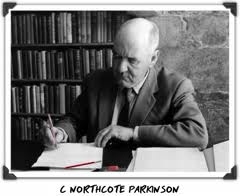 But I tend to believe there is a little more to it than just that, namely “Parkinson’s Law.” For those of you who may have forgotten, “Parkinson’s Law” was devised by C. Northcote Parkinson, noted British historian and author. His original book, “Parkinson’s Law: The Pursuit of Progress,” was introduced in 1958 and was a top-selling management book for a number of years (it is still sold today). The book was based on his experience with the British Civil Service. Among his key observation’s was that “work expands so as to fill the time available for its completion.” Basically, he suggests that people make work in order to rationalize their employment. Consequently, managers create bureaucracies and superfluous work to justify their existence, not because it is really needed. As an aside, CEO’s clearly understood Parkinson’s Law, which became the driving force behind the flattening of corporations in the 1990’s, such as General Electric under Jack Welch’s reign. Whereas Parkinson was primarily concerned with people, his law is equally applicable to machines, particularly computers; for example, Parkinson’s Law can be applied to computing in terms of “Data expands to fill the space available for storage.” Years ago I had a Compaq Presario computer with 50mb of disk space, which I considered substantial at the time. I never dreamt I would be able to fill up the hard drive. But, of course, I did (as well as other PC’s I have had over the years). My current PC has a hard drive with a capacity of 224gb and though I’m a long way from filling it up, inevitably I know I will for two reasons: I now feel more comfortable with downloading large multimedia files (MP3, AVI, WMV, etc. ), PDF files, data base files, and other larger file formats, and; Second, because developers have become sloppy in programming. Back when memory and disk space were at a premium, there was great concern over the efficient use of computer resources. Program code was written very tightly and consideration was given to file size. For example, establishing a simple file index was scrutinized carefully. But as the computer capacity grew and hardware prices declined, developers became less interested in efficient programming. To illustrate, not too long ago packaged software installation programs were delivered on 3.5″ diskettes. Today, it is not uncommon to use multiple CD’s to install the same products. This means that as computer hardware capacity increases, software becomes more bloated. This is but one example of Parkinson’s Law as applied in computing. As another example, let’s consider data transmission lines as used in networking. It doesn’t seem long ago we were using 14.4 baud modems over telephone lines. I remember when we doubled the speed to 28.8 and then 56.4. It seemed like the sky was the limit with every increase. But eventually performance seemed to slow to a crawl. Was it because the technology was aging or was it because our web pages were becoming bigger and more complicated requiring greater data volume over the lines? Frankly, it was the latter. Today, DSL and cable are commonplace in households as well as in business and “dial-up” is rapidly becoming a thing of the past. But as data volume increases with the number of subscribers, will we ever hit a wall in terms of capacity with DSL and cable? Undoubtedly. Again, more due to Parkinson’s Law then anything else. Make no mistake, computer hardware and software vendors are acutely aware of the role of Parkinson’s Law. It is what allows them to build-in planned obsolescence into their products. As consumers reach capacity, they can either add additional capacity or, more likely, purchase new computers. There is undoubtedly an incestuous relationship between hardware and software vendors. Hardware enhancements are primarily implemented to increase capacity in order to overcome software inefficiencies, and software vendors make their products more bloated as hardware enhancements are introduced. To illustrate the point, is it a coincidence that every major release of Windows requires additional hardware support? Hardly. This is done more by design than by accident. Parkinson’s Law is just as much a part of computer technology as it is in the corporate world. But what would happen if we decided to “flatten” computer technology in the same manner that Jack Welch flattened G.E.? Keep in mind, Welch did so to eliminate bureaucracy and force his workers to become more efficient and focus on the true problems at hand. By flattening the “bloatware” we would probably get a lot more mileage out of our computers. But I guess that wouldn’t be good for selling computers (or the economy). I guess Parkinson’s Law and the vicious circle of computing will be with us for quite some time. John Keene paced his Chillcothe prison cell late at night. It was a habit he had developed over the last couple of years after he had been incarcerated for his latest check kiting scheme. He found pacing helped clear his head and allowed him to think. It troubled him that he was getting close to 30 years of age and had never done anything with his life. He had a long arrest record which included many petty crimes. Even in crime, he never really hit the big time and this frustrated him greatly. In terms of education, he never went beyond high school as he couldn’t afford college and the military wouldn’t take him due to his arrest record. For the last ten years he had simply drifted from one scam to another until his luck finally ran out in Ohio. Despite his run-ins with the law, he still had a huge ego and thought that holding a regular job was for chumps, but as he paced his cell he realized what he was doing wasn’t hacking it either. Instead of these smalltime scams, it was time to go after something bigger, such as embezzlement. If he could just get hired by a bank or insurance company, or perhaps a large department store, he could work his way into a position to tap into their accounts. But to do so, he realized he needed to clean up his image. Getting a new identity wouldn’t be a problem, but getting an endorsement would be something else. He needed something respectable, something that was well known and beyond reproach. Keene then had an epiphany, “I know, I’ll join the Masons!” he said to himself. He had known of the Masons since his youth as the pillars of the community. They were somewhat secretive but everyone knew them to be a tight-knit group with impeccable credentials. If he could just get into the Masons, this might be just the type of reference he needed to get into an established company. If all went well, Keene was scheduled to be paroled in a few months. He made good use of his remaining time in the prison library where he studied everything he could find regarding the Masons. He learned about their membership application process and felt he could easily deceive the Masons through his personality and rehearsed answers to their questions. As part of his investigation he discovered that the Masons were desperate for members, and this might be the opening he was looking for. If he could find a small Lodge that was struggling for members, perhaps he could bypass a lot of the Masonic red tape to join. He then scanned various geographical locations until he zeroed in on Columbus which was home to many banks, insurance companies, and other large companies. Keene’s parole hearing finally came up in January and thanks to his good behavior, he was granted a parole. He was asked where he would be settling and he told them of his intention of finding work in Columbus. He was then assigned a parole officer he would have to regularly report to. Upon his release he made his way to Columbus and found work at a fast food franchise. During his free time he went about the process of getting a new identity. He began by visiting a local cemetery where he found a grave of a young boy who was born around the same time as himself, the name was Michael J. Burton. Next, he secured a copy of Burton’s birth certificate and, using it, applied for a social security card. Once he had the card, he next applied for a driver’s license, then finally a U.S. Passport. The whole process took just a few short months. Next came a checking account, gasoline cards, and finally credit cards. The prison system had taught him well. By May, Keene/Burton was ready to make his application with the Masons. He had studied the Masonic Lodges around Columbus closely and found one that was remarkably small (less than 100 members) and was on the verge of closing its doors due to dwindling finances. Keene contacted the Secretary of Buckeye Lodge No. 1557 who was delighted to hear from him and promptly mailed him a petition to join the Lodge. Using his new identity, Keene falsified the petition and returned it to the secretary along with payment of the initiation fees in full. During Buckeye Lodge’s Stated Communications, the Secretary surprised the Craft (only six were in attendance) by reading the petition. This delighted the Lodge as they had not received a new member application in two years. In particular, this pleased the Master, Gordon Shields, who wanted to waste no time getting some new blood into the Lodge. The petition was accepted and followed its usual course, except the Lodge glossed over the investigation as the Master couldn’t find anyone to perform the task. Instead, the Master invited Keene to the Lodge and talked to him about what it meant to be a Mason. He found “Burton” to be an honest, clean-cut and forthright individual. Little did he understand his true background, particularly since he didn’t check his references. Keene’s petition was finally balloted upon one month later as scheduled where it was found clear in the South, West, and East. Bro. DB Hunter happened to attend the meeting that night and was pleasantly surprised by the petition. Hunter was the Lodge’s Instructor and was pleased to hear he would once again be asked to teach a Brother his catechism. Shortly after the ballot, the Master scheduled Burton’s Entered Apprentice degree for mid-June which was performed accordingly. Keene then began to meet with Hunter on a regular basis to learn the EA catechism. At first, he was surprised by the amount of memorization work required, but finally learned the rhythm of the work and quickly mastered it, perhaps too quickly. During catechism meetings, Hunter liked to develop a rapport with the new Brother to see what kind of Mason he would be. Although Keene would volunteer some information, Hunter found him to be somewhat evasive on his past. Instead, Keene wanted to accelerate the practices. Hunter liked Keene’s enthusiasm, but found it a bit disconcerting that he wouldn’t volunteer information about himself. Keene learned the EA work and was able to return it in Lodge during the month of August. 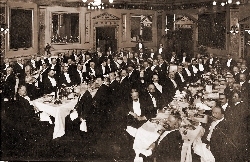 Shortly thereafter, the Lodge conferred the Fellow Craft degree on Keene and, consequently, he continued his sessions with Hunter to learn the second degree. During one of the meetings, Keene proudly displayed a Masonic ring he had purchased. Hunter pointed out to him that it shouldn’t be worn until he had been raised to Master Mason, but this did little to subdue his enthusiasm as he knew his training would soon be over and he could dump these “bumpkins” once and for all. To Hunter, Burton was an enigma; on one hand he was very enthusiastic about the fraternity, but on the other there was a dark and evasive side of him which disturbed him. Consequently, DB contacted Shields to discuss Burton’s background. In the process he discovered that the Lodge in its excitement of getting a new member had performed a superficial investigation of the candidate. Suspicious of what was going on, Hunter telephoned “Doc” Simpson, a Brother Mason who served in the law enforcement community and asked him to do a background check on a Michael J. Burton. The deputy told him he would do so but it would take a couple of weeks. Hunter agreed and continued with Keene’s catechism practice while he waited for the results. In an attempt to postpone the raising of Burton to Master Mason, Hunter stretched out the catechism training until he heard back from Simpson. Prolonging the training irritated Keene as he wanted to be raised and move along. Nevertheless, he mastered the work and successfully returned it back in Lodge in early October before Simpson had completed his investigation. There was now nothing to stop Keene from being raised to the sublime degree of Master Mason, or so he thought. Shortly after Keene had completed his Fellow Craft training, Simpson called Hunter and reported he couldn’t find any criminal activity associated with Michael J. Burton. There was just one problem though, Michael J. Burton died 25 years ago. This concerned both Hunter and Simpson greatly as they realized they either had someone with a false identity or someone who had changed his name somewhere. Simpson told Hunter to somehow obtain Burton’s fingerprints or a sample of DNA. The DNA would be hard to get as it would inevitably tip off Burton, but the fingerprints would be easier to obtain since he always drank a glass of water during the catechism practice. Fortunately, Hunter was able to obtain a glass with Burton’s prints on it and gave it to Simpson to analyze. After a few days Simpson met Hunter at the Lodge and reviewed the results. Lo and behold, the fingerprint tests resulted in the criminal dossier of John M. Keene, complete with mug shots. Hunter verified that it was indeed Burton. He then picked up the phone and called the Master and asked him to meet the two at the Lodge. When Shields arrived, Hunter and Simpson explained to him what they had found. Shields was aghast that someone with such a background could have penetrated the Masons and was embarrassed by his own investigation. But what to do? Simpson couldn’t find anything where Keene may have misled someone about his identity, only the Masons. Surely they couldn’t make Keene a Master Mason based on what they now knew, nor should they allow him to continue the charade to some other unsuspecting person or institution. “I have an idea,” said Hunter. The Worshipful Master scheduled Keene’s raising for the evening of October 31st, Halloween. Keene was delighted. Not only would he finally learn the secrets of the Masons, but he had also been able to secure an interview for a clerk’s job in a downtown bank during the first week of November. The timing was right for Keene to move into the next stage of his plan. The Master explained to “Burton” that since he was the first person to join the Lodge in a couple of years, this was going to be a special degree and would be held outdoors. Keene had heard of such degrees by the Masons and, as such, the honor fed his ego. He was told to arrive at a remote field north of the city precisely at 7:30pm, not a minute sooner or later. Keene knew the spot and became fascinated by the intrigue. Ohio had experienced an Indian Summer with warm temperatures during the day and cool evenings. On Halloween night it was a balmy 72 degrees with a cloudy overcast as Keene arrived at the field precisely at 7:30pm. As Keene got out of his car he was approached by Hunter who welcomed him warmly. He assured him that he had nothing to fear and that he would learn a lot from the degree. Hunter then asked him to change out of his clothes and don a set of plain blue pajamas and sandals. About fifty feet away Keene saw the members of the Lodge standing in a single line facing east. Each held a torch in their left hand, their right hand covering their heart, and wearing a Masonic apron. Not a word was spoken by the group and despite Hunter’s assurances, Keene grew a bit apprehensive. Hunter presented Keene directly in front of the group. “My Brothers I hereby present Michael J. Burton to be raised to the ancient and honorable degree of Master Mason. He has made suitable proficiency in his preceding degrees and now seeks the light of Masonry.” After which Hunter left Keene’s side and rejoined his Lodge Brothers in the line. The Worshipful Master stepped forward from the line and faced Keene. He then called upon the Chaplain to lead the group in prayer. Following prayer, Shields turned to Keene and said, “You are now standing before Brothers who have traveled this way before you. I am afraid you have a rough and rugged road before you to seek the light of Masonry. Walk softly, listen carefully, memorize the words, and learn from their wisdom. You will now turn 180 degrees to face the East,” and the Master helped turn him in the proper direction. Keene slowly walked away from the group as instructed. It was pitch black at night, and the only light he saw was from the torches held by the Masons who stood motionless behind him and a small dot of light ahead of him. He realized he was in a meadow as he didn’t encounter any trees. Perhaps it was a cow pasture. He chose his steps carefully as he didn’t want to step in anything or lose his sense of direction. From time to time he would look back to see the line of Masons standing far behind him with their torches. As he advanced he could see the dot of light grow larger but in front of it appeared a body of water, a small lake of some kind. As Keene came up to the edge of the water an old man approached him clothed in a strange costume holding a six foot staff. To Keen, the man appeared to be dressed as some sort of ancient mariner which he had seen in history books from biblical times. “The light of Masonry,” Keene said hesitantly. “Then you have traveled the right path for I am to be your guide. Across the waters you behold the light of Freemasonry,” and he pointed to the other side of the lake where Keene could now see the dot of light was a bonfire of good size. Removing his clothes in front of a strange man didn’t bother Keene as he had done it plenty of times while in prison. As he removed his clothes he could still make out the line of lights behind him from the Masons. He then handed his pajamas, along with the sandals, to the man who put them into a bag for safekeeping. He now stood naked before the old man and felt a little shiver from the cool night air. Keene looked across the lake which he judged to be about 100 yards away. “No problem,” he said confidently. Keene was hesitant at first as he thought Masons practiced intemperance, but after some encouragement from the old man he took a deep drink of it. “Go ahead, take another swig, it’ll keep you warm in that cold water.” And Keene did so. “You will now cross the waters. Swim strongly, swim carefully, and beware of the serpents of the deep. When you arrive on the other side you will be met by your Brothers. As quick as you can, you must jump before the light and exclaim three times, ‘God Almighty, show me the light.’ Do you understand this? Repeat it.” Keene did as he was told. “Then may the Grand Architect of the Universe be with you. I bid you farewell,” and he stepped aside to allow Keene to step into the lake to test the water. The lake was a bit chilly but Keene’s body quickly acclimated to it. He swam slowly and methodically as it was still dark and he reached out to touch anything that might be in his way. 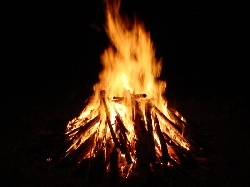 As he neared the other bank he could see the bonfire more clearly but could only make out silhouettes of a few people sitting around the fire. He thought he would make the best of it and give them all a good show. After all, if those old geezers could do it, he could as well. Girl Scout Troop #132 looked up horrified. They had come out for their annual Halloween camp out at the county park but had not expected to see some drunk naked lunatic jumping around their campfire. Fortunately, the adult chaperones present were able to subdue Keene and covered him in blankets. Deputies from the nearby Sheriff’s office were summoned who arrested Keene for public intoxication, indecent exposure, and lewd conduct in the presence of minors. As he was being placed in the Sheriff’s patrol car, Keene looked back across the pond to see the Masons and old man, all of which had conveniently disappeared. Epilogue: The strangest things occur on All Hallows’ Eve: membership records mysteriously disappear, Masonic rings and identity cards are lost, criminals are apprehended, parole officers are anonymously notified of indiscretions, and other things that go bump in the night. Boo! 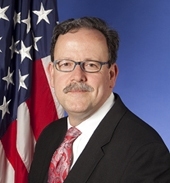 The Commissioner for the bureau is Dr. Keith Hall who manages a 2,500-person organization which is the principal fact-finding agency for the Federal Government in the broad field of labor economics. Translation, they’re number crunchers. It is Dr. Hall’s group that is charged with sampling the prices of consumer items and calculating the Consumer Price Index. I therefore presume they are sampling products from around the Washington, DC area which must be pretty cheap if the 1.15% inflation rate is any indication. This is all well and good for Washington, DC, but I suspect the rest of the country is operating at a much higher inflation rate. For example, have the prices at the grocery store been going up or is it my imagination? Gasoline prices keep inching up as well. The cost of travel is up, as are utilities and other services, such as garbage disposal. I have a friend who owns a restaurant and complains he is now being charged $30 more per month to have his grease trap emptied. His produce bill is up as well. Even the Postal Service is again seeking a rate hike, averaging four percent to six percent, which would far exceed the “official” rate of inflation. 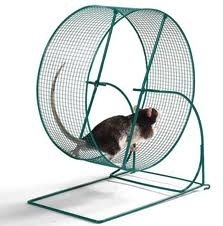 Dr. Hall, please send your minions to Palm Harbor, Florida and test our prices. We must be operating on a different wavelength than Washington, DC, and I suspect the rest of the country is as well. Don’t insult us though by stating unequivocally that inflation is a mere 1.15%. I will wager that the people who calculate our inflation rate are the same knuckle heads who recently claimed the recession was over in June 2009. I’m sorry, but I’m just not buying it. * Where are my workers? * Are they working on the proper assignments? * How are they progressing? Are they on-time and on-budget or are they over/under? * When will they be finished? * What problems are they experiencing and how can I help them? * Streaming meetings in either audio and/or video formats (podcasting). 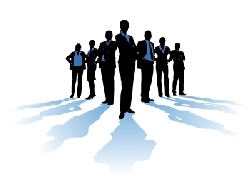 * Using Internet discussion groups to exchange comments and questions. * Collaborative tools accessible through the Internet (such as “Google Docs“). These are useful and inexpensive tools for communicating with workers, but there is nothing better than to be able to look into someone’s eyes in a meeting. * Cell phones and VoIP related telephony, such as Skype, Yahoo! Messenger, and Google’s new Gmail telephone calling service. * A well organized e-mail address book. * A centralized calendar that can accommodate both the individual and a group of workers (see “Google Calendar“). * A centralized list of project priorities that can accommodate both the individual and a group of workers thereby encouraging workers to row on the same oar. NOTE: The manager should make provisions for employees to initial the document to acknowledge they have reviewed the latest version of priorities. * Reporting the use of time during the day by each worker, including time applied against project assignments, and interferences such as travel, meetings, reading e-mails, etc. * For each project assignment, a facility should be included for each worker to report the amount of time remaining on a given task (aka, “Estimate to Do”). This is part of the Project Management system’s early warning system to warn a manager when an assignment will be either early, late, or on time. * A skills inventory, to assist the manager in keeping track of the skills and proficiencies of his workers, thereby providing the ability to match the right worker to the right assignment. Over and above this, there is one important project management tip I cannot overemphasize: bind deliverables to project assignments. Filling out time screens is one thing, demonstrating the task is actually completed is something else. There must be a tangible and reviewable result produced from each assignment to substantiate completion. Without it, a worker could falsely claim they have completed a task. By binding deliverables to assignments, managers can challenge the worker to prove they have completed an assignment (a deliverable has either been produced or it hasn’t). This approach to deliverables is also an important part of implementing an effective Quality Assurance program. If you can specify the criteria for accepting a deliverable, it can be reviewed for errors or omissions. True, there are some slick tools available today that I wish we had years ago when we had nothing more than pencil and paper. What I find interesting though is the problems in today’s “agile” workplace are essentially no different than when I entered the workforce over 30 years ago. For more information on this subject, read my earlier PAPER. Whether you love her or hate her, you have to hand it to the promoters of pop music icon Lady Gaga who seems to have exploded on the music scene in the last year or so. Her flamboyant dress, presentation and lifestyle has made her the darling of the music world, an envy of the gay community, and an unsurpassed cash machine that can make anyone’s head spin. The press went wild for her avant-garde “meat dress” at a recent music awards program. Her celebrity is such that she placed fourth in Forbes magazine’s list of the 100 Most Powerful and Influential celebrities in the world (June 2010), as well as Time magazine’s 100 Most Influential people. As to her prowess as a musician, I cannot personally name or recognize any of her songs, but I’m sure her fans can. Whether the 24 year old from New York can stand the rugged test of time is yet to be seen. Nonetheless, she remains a cultural phenomenon that is probably as well known for her outrageous outfits as well as her music. She is currently riding high as the queen of pop music, having easily surpassed her predecessors like Christina Aguilera and Madonna. Okay, she is a pop star. Granted. But now she is using her celebrity for political purposes and has become immersed in gay activism. She recently made an impassioned speech in Maine for revoking the military’s “Don’t ask, Don’t tell” policy. Undoubtedly this will not be her last foray into political theater and she will likely push for other causes she believes in. The question is, how credible can she become and will she truly influence anyone? Her youth and flamboyance may be an important part of her celebrity, but it doesn’t exactly make her a credible political spokesman. Although she may influence teenagers, I doubt she will influence adults older than herself. In their eyes, she is just another entertainer capitalizing on her notoriety and looking for more publicity. In other words, Stefani Germanotta (her real name) is probably hurting the causes she claims to support as opposed to helping them. Getting political advice from Lady Gaga is like getting love advice from Paris Hilton or drug treatment advice from Lindsay Lohan, it tends to lack credibility. She would be more effective keeping her mouth shut and passing a few dollars under the table to her favorite causes. In other words, continue your act, don’t get sidetracked, and take the money and run. So, is Lady Gaga a cultural phenomenon? Undoubtedly. Is she a talented musician? It depends on who you talk to. Is she a political sage? Hardly. For a sample of her political oratory, click HERE. It seems I’ve been attending a lot of funerals lately. I’ve noticed they seem to come in spurts. For some reason, the fourth quarter seems to be the busiest season for me. Maybe there is something in the water after all. I don’t wish to make lite of funerals as it is an uncomfortable subject for people to discuss and something we don’t really like to attend, but I’ve noticed some subtle changes occurring in funerals recently. At funerals, it used to be, bereaved family and friends would gather and try to console each other. A member of the clergy would say a few words from their book of faith, and someone would deliver a eulogy, either a relative or a close family friend. As a Freemason, I have attended several funerals where I’ve been asked to say a few words on behalf of the dearly departed’s fraternity, which is usually quite somber. Sometimes there is a wake afterwards featuring refreshments, sometimes there isn’t. As I sat through the latest round of funerals recently I started to notice some changes. Yes, the family is still filled with sorrow, but there is more of a festive atmosphere to the occasion. In fact, the ceremonies looked as well rehearsed and choreographed as what you typically find at a wedding or Bar Mitzvah. For example, the immediate family now marches in procession down the middle aisle to the front of the room, usually with a soloist singing some operatic piece accompanied by a pianist. Had I closed my eyes, I could have easily imagined I was at a church wedding. Members of the clergy still offer words of comfort, but I notice they are now more apt to sing a song as well. Music plays a much more significant role nowadays and it is not necessarily solemn or religious tunes anymore. As the family wants to celebrate the life of the dearly departed, it is not uncommon to hear more contemporary tunes which strikes me as unusual, even Broadway show tunes (e.g., “Bali Ha’i”). I’ll know it’s really getting weird when I finally hear “Whip It” by Devo. At my service, I hope somebody remembers “House Burning Down” by Jimi Hendrix. 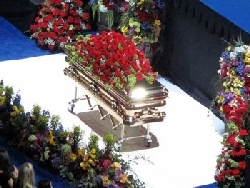 Eulogies are still a natural part of the service, but they are now very well scripted and rehearsed. I’ve discovered there are a lot of resources on the Internet for writing eulogies and I’m told some people will write one for you, for a price. Perhaps the centerpiece of the funeral service experience is a MS PowerPoint slide show featuring touching photos of the deceased along with quotations and various other trivialities about the person. Such a presentation used to be nothing more than a curiosity for playback on laptops. However, now it is professionally produced and broadcast on big screens. I can’t wait for them to develop a “Sensaround” version. Instead of cold cuts and whatever else the family could offer to drink, wakes are turning into lavish affairs with caterers, servers, and bartenders all being paid big bucks, not to mention hotels, restaurants, and other establishments who now host such affairs. To me, it’s a little scary when a funeral reception can become more opulent than your wedding reception. It’s interesting to see a cottage industry springing up around funerals. “Funeral planners” are becoming as intricate to funerals as “wedding planners” are to weddings. Funeral homes are none too happy about this as they believed they had a monopoly on the business. As for me, when I’m gone, keep it short and simple and split up anything left over. I don’t need a lavish funeral. I wasn’t exactly a head of state.